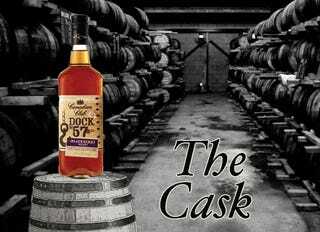 Today we’re going to discuss a more “fun” Whisky, this is a great one to bust out with your non-Whisky drinking friends - Canadian Club Dock 57 Blackberry. for the rest of this column) is genuinely good Whisky! Canadian Club decided to join the big party of flavored Whisky and it seems they stole the show. In the flavored Whisky market, there’s everything from Crown Royal Apple to Jack Daniels Honey to Jim Beam’s Red Stag Cherry. But this, this is my favorite flavored Whisky. So, always remember, the price will vary by state/country and I believe the average for Dock 57 is $18 in the US. I’m in Metro Detroit, so this is the price in Michigan. When you see my taste rating below you’ll understand why this is such an epic price for this whisky. Now, as far as flavored Whisky’s go this is one of the cheapest. I’d also wager it’s one of the best. It’s smooth on ice, it’s great as a fun shot (yet full proof), and even mixes great being a berry flavor. It being only a #3 on my scale isn’t an insult, it’s actually a massive compliment. The price range and target of this is no where near the level of anything sippable. So don’t take the #3 as a negative. If you remember in my first edition of The Cask I told you that I was a fan of all kinds of Whisky’s and that’s definitely showing itself here. I guarantee if you find a serious Scotch drinker he’d turn his nose up at this so fast he’d end up in a neck brace! The truth is people like this stuff. It’s fun and it opens Whisky up to new markets and different audiences. I take Dock 57 on an annual camping trip and everyone loves it around the fire. It’s social and not quite as serious as the Small Batch’s I’ve been reviewing. Seriously, people who don’t like Whisky at all - love this stuff. If you want to have some fun this weekend and get a cheap bottle of delicious Whisky to share (or to be selfish with) that you can even drink on ice this is your bottle! Keep an open mind and have a fun one! Anything you’d like me to review for The Cask? Let me know in the comments! Don’t worry, if you want back into the specialty classy Whisky - I’ll have a nice serious Whisky for the next review!